Are you ready to take the first steps to free yourself from money stress? Do you feel you can't get ahead, no matter how much you work? Have you been working harder and still nothing ever changes? Do you feel that your success is relative to how much money you make? Do you feel unsuccessful because you have not made the money you want to make? Laura Fredrickson is a genius and master at what she does. I have never had someone penentrate my money resistance like her. I have made leaps and bounds in a short amount of time transforming my fears around money into empowerment and joy. You would be silly not to work with her." 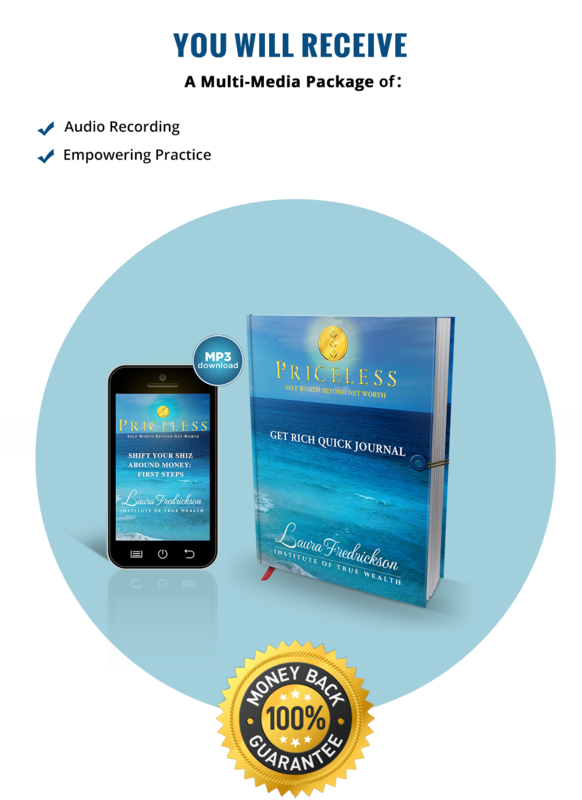 The Priceless Principles course with Laura Fredrickson truly is an invaluable experience. I learned many skills that will stay with me the rest of my life. Within a month I tripled my income and opened to several new opportunities. I highly recommend the course for anyone wanting to increase their happiness and wellbeing." Empower Yourself in this Simple Yet Effective Program! Valued at $39 per month!!!! You will receive full access to additional principles and practices completely FREE!!! "Laura's home study programs provides more than insight - it provides tangible, practical, powerful and simple tools to create true wealth in your life. The rewards have been flowing in BIG ways ever since the moment I invested in her wisdom, but the tool far surpass financial abundance and reach heights that will remind you of your in the world and how incredibly abundant every area of your life can be." 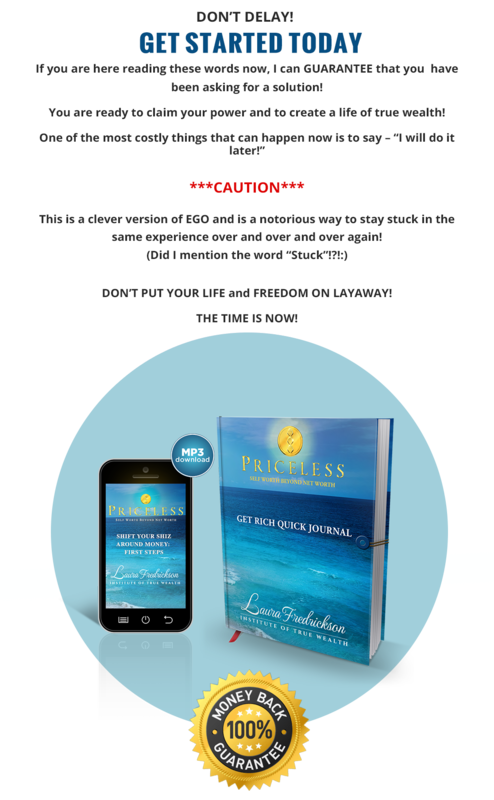 "Laura's 'Priceless' teachings on true wealth and true worth tap into the ultimate zeitgeist of our times, exposing the false concepts that have kept us trapped in limitation, hypnotized by the belief that our source is outside of us -- and giving us a path back home again. A path back to our true value, our true abundance, and the power to manifest our purpose and potential beyond what we have imagined! As my coach and guide many times, I can't even begin to put a price on what she's given to my life." Derek Rydall - Founder 'The Law of Emergence,' Best-Selling Author. "Laura Fredrickson is a genius and master at what she does. I have never had someone penetrate my money resistance like her. I have made leaps and bounds in a short amount of time, transforming my fears around money into empowerment and joy." "Laura has helped me transform deeply conditioned beliefs about money and shift from struggle and scarcity to flow and possibility. I never cease to be impressed by her ability to see opportunities for transformation and insight. If you are ready to live the life you were born for, work with Laura!" "Laura is living proof and an exempler, of someone who has been very far into the darkness, and has come back. She is therefore a very credible person with whom to explore this new way of relating to money, prosperity, safty, security and control. She is credible in ways that most simply are not"
Laura Fredrickson is a True Wealth Coach and Empowerment Specialist, International Speaker and Author, and the Founder of the INSTITUTE OF TRUE WEALTH. Her expertise resides in financial empowerment, emotional well-being, and personal fulfillment. Laura's global mission is to empower people in their lives, specifically in their relationship with money, so they can create an experience of freedom, passion, purpose and security. She is devoted to people remembering their self worth beyond their net worth, and living a life that is rich in all ways, which she refers to as being 'Fulfillionaire". As a trusted guide, Laura has enriched the lives of countless individuals for over 17 years with her Priceless Principles & Practices and her profound, yet simple methodology. I am still in awe of how every aspect of my life has improved and how Laura’s powerful words resonate and guide me to keep me aligned. Laura “full proof recipe” for alignment will initiate vast improvement in your life." My path to discovering a life of true wealth began when my financially stressed parents committed suicide together. In my form of rebellion, I became obsessed with conquering money. I made millions…and then lost every cent. Penniless and pointless, I began to spiral towards suicide. And then… I woke up. After renegotiating my own terms and discovering the foundational principles that govern my personal reality, I began to align with the source of true freedom and happiness, as well as my authentic worth and value. As a result of this, I am now living a life that is truly priceless and have a deep irrevocable sense of inner worth, security and freedom. I have been inspired me to consolidate 20 years of my personal experience and 17 years of professional expertise into these effective online programs that can be understood and directly applied by anyone who is ready to claim their power and live a life of TRUE WEALTH. Thank you for the opportunity to be in service to your journey. It is no accident that you are h​ere, for you are ready to live a life of true wealth, and invest in your most valuable asset – your best life! We are at a pivotal time in our human evolution! Each of us are being invited to awaken from our collective slumber. Suicide rates are escalating, financial systems are crumbling and for the majority of the population pain and drama has become the "Norm". The majority of people have "To-Do" Lists that extend beyond their own life span, and heart disease is at an all time high. The correlation of which is undeniable. Many people have lost their way. However, within these challenges are potent opportunities to become empowered and renegotiate our own terms. It is time to claim an experience that is truly meaningful, and to realize experiences of true freedom and security. We have the opportunity now to create a new paradigm of true wealth and success, which includes passion, purpose and prosperity. Deliberately creating lives that are emotionally rich and authentically abundant. After 17 years of personal experience and professional expertise in the realms of money, self worth and manifestation principles, I am thrilled to be distilling my ‘Priceless’ Principles and Practices on Self worth beyond net worth, into this Home Study Program! 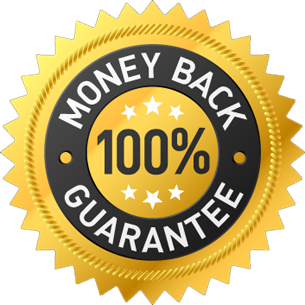 You are absolutely able to receive a full refund, provided you have gone through the program and practices and have not received any benefit. Will I make a lot of money by doing this program? If you are looking for a traditional ‘Get Rich Quick’ program you have definitely come to the wrong place. You will create abundance in your life in the form of money, however the primary focus is on truly making a living, which is to say you enjoy your creative journey and are not making money at the expense of your own happiness and well being. This program is about cultivating an experience that is rich in all ways, money being one version of that richness. Would you rather be a ‘Fulfillionaire’ or a ‘millionaire’? I'm really busy. Will this program require a lot of time and energy? No, this program requires your intention first and foremost, and in addition to that approximately 5-15 min per day (minimum of 4 days a week) for your ‘homework’. In order for shifts to occur all that is required is an internal shift from 49% to 51%. The Law of Physics and momentum will handle the rest. This is not about ‘’perfection” or the micro management of 60-80K thoughts a day (thank goodness)! That would be exhausting!! This program is about ease and grace. You will learn how to shift your perceptions and attention in an easy way based on awareness, with a focus on alignment. What results can I experience from doing the Priceless Program? The first sign of evidence is an improved state of being -feeling more calm and empowered. Since you are attracting based on how you feel, everything in your life – relationships, health, career and money will begin to reflect back for you this better feeling state. In a short amount of time (3-4 weeks) you will start to see literal evidence in the form of new opportunities and greater abundance in the areas that are meaningful to you. How is this program unique from all of the others on the market relative to Abundance? Laura’s intense personal experiences partnered with 17 years of working with people, give her an innate ability to facilitate sustainable shifts for those that do her program. Her program and methodology are simple and practical. She also provides basic practices that allow you to ground these principles in your everyday life for sustainable results. Unlike traditional therapy, we won’t go down memory lane and have you focus on what has occurred in your past. What we focus on expands, which will produce the same experiences in different packages if we continue to regurgitate our old stories. In order to create a new experience, you must tell a better feeling story. In our journey together you will learn how to shift your experiences in the spirit of awareness, not processing or indulgence.